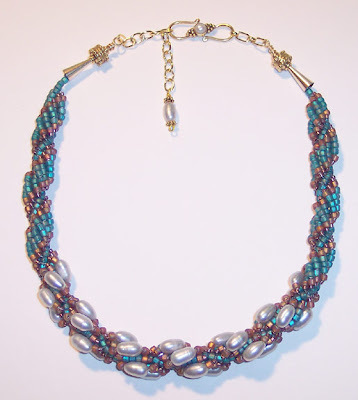 No matter how intuitively you work, at some point you will need to make some decisions about the structure and pattern you’re going to use in order to avoid having to go bead buying right in the middle of a project. That is usually not the best time to be making clear-headed decisions! You might be the type of person who decides what project to do based upon what type of stitch you feel like doing, and you make most of your structural choices at the very beginning of your design process. For me, the technical details are often one of the last things I consider, but like all of the other pathways into designing, structural questions can easily pop up at any time along the way. In design terminology, pattern generally refers to repetition or lack of it in stringing or weaving a piece. (It can also refer to the plan for the exact placement of beads in something like a flat peyote weaving, but that’s not what I’m referring to here.) The pattern can be repeating, symmetrical, asymmetrical, or random. No matter how complex your piece is, from a single strand to the most intricate multi-strand weaving, these underlying patterns can be detected. Asymmetrical and random patterns are the most dynamic and challenging to the eye, but can still be peaceful and pleasing if they are balanced visiually, either by color repetition or by judicious placement of larger beads. A peaceful feel may not be your desire, however! Repeating and symmetrical pieces tend to be easy on the eye with a classic feel, but they can also be seen as static and boring. You can use your pattern choices to keep the eye moving around the piece, or to focus it on a spot you choose. Pick the pattern you use to complement your entire theme and be aware of the underlying message pattern can send subliminally. This is certainly not an unimportant afterthought, even if pattern isn’t the first design element you consider! Other structural considerations in designing include length, complexity, and contruction methods/techniques. Will your necklace be a standard length or adjustable? How many strands will it contain? Will it be needle-woven, strung, loomed, or a combination? Will your design necessitate large-holed beads that can accommodate many thread passages? Will it require special findings that you must buy or make? Will you use thread, wire, or some combination? Do you have enough materials and all the tools you will need? This is also a good time to fill in all the gaps, before you start constructing. You may need to head back to the torch or go on a (perfectly justifiable) shopping trip. Make sure you’ve got enough of everything, including all the mundane items like thread, wire, crimps, jump rings, and spacer beads, to complete your design.